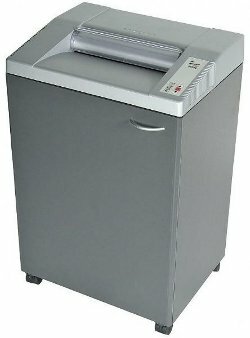 The GBC 5550X Cross Cut Office Shredder - Shreds 14 - 16 sheets per pass into over 300 bits. Extra large 42 gallon shred bin. Continuous duty rated motor. 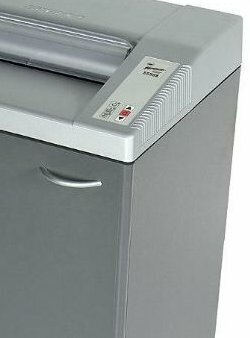 The shredder has an auto on-off button. EZ-feed throat. The shredder has a bag full shut off. Auto on-off jam. SmartShred Controls-separate indicator lights for power on, bin full, overload and door ajar. 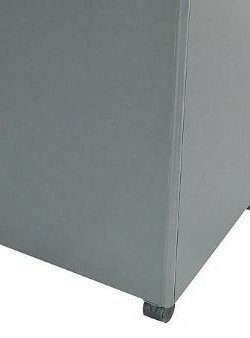 * Shred Size (Inches) — 5/32 " x 1-1/2 "
* Size— 37.5"H x 24.25"W x 18.5"D.